Seasonal Affective Disorder (SAD), often referred to as "winter blues�� or seasonal depression, is a type of depression related to changes in the seasons1. Most often affecting individuals in the fall or spring months, it can have a profound effect on an individual��s mood and energy levels. Those affected by SAD often feel like isolating themselves until a change in seasons occurs, usually spring, however this isn��t a viable solution for anyone1. In Canada, SAD affects around 3% of Canadians each year, with approximately 15% experiencing milder forms of SAD2. Often, this disorder impacts children and teenagers, with women having a higher propensity to experience SAD over men. Additionally, if there��s a history of depression in the family, individuals have a higher risk of experiencing SAD in their lifetime2. A research study conducted by Oxford University has found there are many methods to minimize the effects of SAD3. Meet with a Healthcare Practitioner. Discussing medical treatment or support from a qualified healthcare practitioner can be a useful first step in identifying the ideal treatment option. SAD is a treatable disorder, where healthcare practitioners can provide resources to build resilience prior to months where SAD is at its peak. Some of those suggestions are mentioned below. Light Therapy. When using light therapy, results have shown relief between 60 to 80 percent for those who suffer from SAD. Sitting for 30 minutes in front of a special fluorescent light that simulates natural outdoor light, can help improve an individual��s mood and energy levels. The best time to use this form of therapy is in the morning, so an individual can reap the benefits throughout the day4. Cognitive Behavioural Therapy. This form of therapy works to replace negative thoughts with more positive ones. It can be used in conjunction with light therapy, and according to some, is the most effective way of treating the disorder. Self-help. There are many ways to minimize symptoms of SAD outside of professional medical help. Individuals who regularly exercise, have good sleeping habits, eat a healthy diet, and stay connected with others have improved moods during SAD months. Working towards a more balanced lifestyle can help manage stress and reduce the symptoms of depression. Using these self-help tools year round can help minimise the likelihood of suffering from SAD, and improves one��s overall health and well-being4. Discussing medical treatment or support from a qualified healthcare practitioner can be a useful first step in identifying the ideal treatment option. 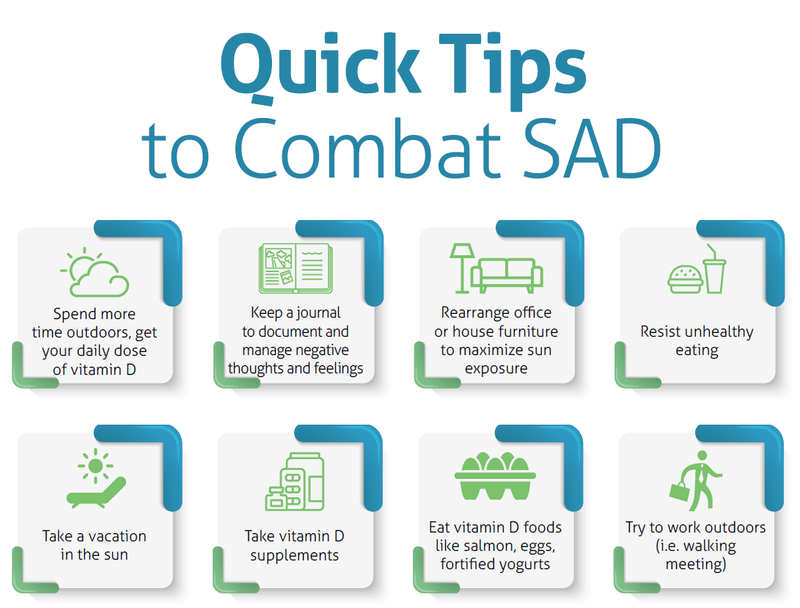 SAD is a treatable disorder, where healthcare practitioners can provide resources to build resilience prior to months where SAD is at its peak. Avoid alcohol, and be aware of your caffeine intake. Both alcohol and caffeine can affect your sleep and make you feel groggy and grumpy. On the other hand, make sure you��re drinking enough water. Build routines to get you outside during the day. Try to find opportunities for a brief outdoor walk during daylight. Increase physical activities or exercise prior to typical SAD months. This can help to build a healthy lifestyle prior to SAD symptoms, potentially preventing or limiting SAD symptoms each year. Physical activity relieves stress, depression, and increases your energy, combatting the majority of the SAD symptoms. Keeping a journal can help you to deal with the negative feelings one can experience. Plan to write each day for a week, including your thoughts, feelings and concerns. The best time to write is often at night, which allows you to reflect on all that happened during the last 24 hours. Re-arrange your space to maximize exposure to sunlight throughout the workday. Try to keep the curtains open during the day and position yourself to face natural light where possible. Resist the urge to eat unhealthy sugary or high carbohydrate foods. Although often craved when experiencing SAD symptoms, this can increase depression and weight gain, further increasing SAD symptoms. Take a vacation, look for sunny destinations. Save throughout the year to alleviate potential financial strain. Reminder, symptoms of SAD can recur after you return home. Take vitamin D supplements or eat foods high in vitamin D, such as cow��s milk, soy or rice beverages, orange juice, salmon, eggs, or fortified yogurts. Since getting more sun exposure is dependent on weather and time, change your diet during fall and winter can help you get the vitamin D you would typically receive from sun exposure. Try to spend more time outdoors during the day. Spending time outside for 30 minutes can help your body absorb enough vitamin D to help improve overall mood.